I'm only going to say this once. 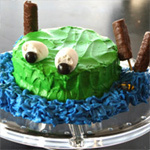 You need to make this recipe. Yes it takes awhile to cook, but think of it as a crock pot meal. Once you get it in the pot, it cooks by itself while you (hopefully) rest. 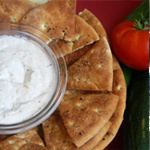 It's a crowd pleaser and a solid recipe for any cook to have in his/her time tested arsenal labeled "in-law" and "kid-friendly". As far as kid's go, this is even better than spaghetti sauce out of the jar. It even has a common place name that won't scare Grandpa: Beef stew. Sure, it has some definite ties to Julia Child's Beef Bourguignon, but no one needs to know but you. It's our secret. I've replaced red wine with cranberry juice to make it more of an everyday meal, but red wine works well too. The cranberry juice is just tart enough to add the flavor you need, so give it a try. You'll be pleasantly surprised. 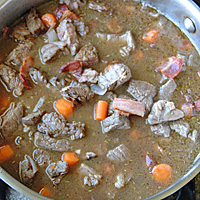 You can buy stew meat for this recipe, but I like to cut my own to save on cost. Chuck roast is the best, in my opinion. you only need 1/2 of a typical sized roast. 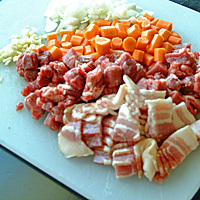 Remove the larger portions of fat, as shown, and cut the meat into bite sized pieces. Next cut the bacon and chop the vegetables. The garlic doesn't need a press, just roughly chop. Start with the bacon. Cook in your soup pot (preferably NOT non-stick) on med high. Mine is a skillet size, but you will need a taller pot if you double the recipe. Don't move the bacon until it browns on the bottom, and watch that you don't burn the pan too much because you will need the drippings. 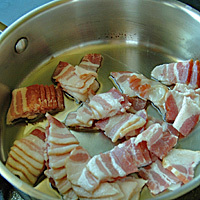 Remove the cooked bacon to a paper towel to drain. This is going to be so good. Can't you tell already? Working in three batches, brown the meat in the bacon drippings. You need to keep enough oil or drippings in the pan to lightly cover the bottom and keep the meat from burning. Add canola oil as needed when you switch batches. Don't worry if the pan turns a little dark. That's okay: it adds flavor as it comes off the bottom once you add liquid. 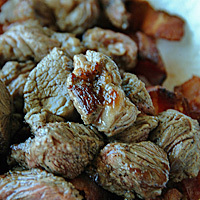 Don't move the meat around much until it caramelizes on the bottom. That dark color you see here is what you are looking for on the meat. Let meat rest with the bacon. 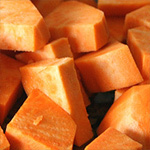 Turn the heat down to med and cook the vegetables for two to three minutes. Add more oil if needed. Return the beef and bacon to the pan. 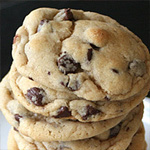 Sprinkle with 1T flour and stir to coat. Add all remaining ingredients and bring to a boil on high heat. Cover and turn heat as low as it will go. Simmer for 2 hours, checking in the last hour to make sure there is enough liquid remaining in the pan. If not, add more beef broth 1/2 C at a time. 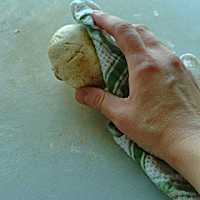 Instead of rinsing your mushrooms, wipe them off with a damp cloth. You don't want the extra water touching them. 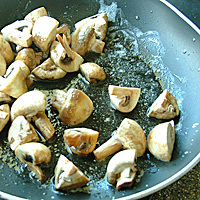 Quarter the mushrooms In a non-stick skillet, combine 2 T butter and 1 T oil. Add the mushrooms just before serving. I also like to serve mine with mashed potatoes, but they aren't necessary. Problems: Tough meat Almost any roast will tenderize if you cook it long enough. If the meat isn't fork tender, keep cooking on low heat until it is. It's never taken longer than two hours in my experience, and some amazing roasts are done in an hour and a half. But if not, give it two and a half hours. It's worth the wait. 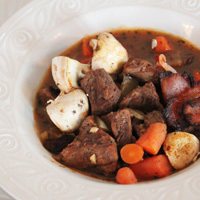 You can buy stew meat for this recipe, but I like to cut my own to save on cost. 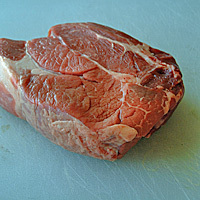 Chuck roast is the best, in my opinion. you only need 1/2 of a typical sized roast. 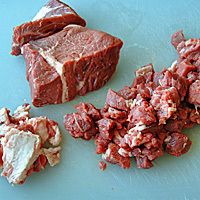 Remove the larger portions of fat, as shown, and cut the meat into bite sized pieces. Next cut the bacon and chop the vegetables. The garlic doesn't need a press, just roughly chop. Don't move the bacon until it browns on the bottom, and watch that you don't burn the pan too much because you will need the drippings. 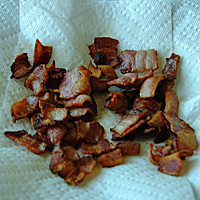 Remove the cooked bacon to a paper towel to drain. Working in three batches, brown the meat in the bacon drippings. 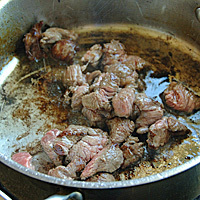 You need to keep enough oil or drippings in the pan to lightly cover the bottom and keep the meat from burning. Add canola oil as needed when you switch batches. Don't move the meat around much until it caramelizes on the bottom. That dark color you see here is what you are looking for on the meat. Let meat rest with the bacon. Turn the heat down to med and cook the vegetables for two to three minutes. Add more oil if needed. Return the beef and bacon to the pan. Sprinkle with 1T flour and stir to coat. 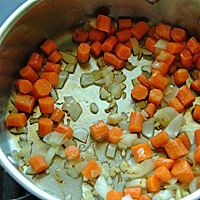 Add all remaining ingredients and bring to a boil on high heat. 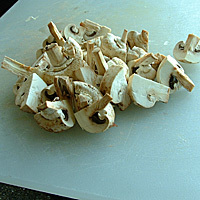 Instead of rinsing your mushrooms, wipe them off with a damp cloth. You don't want the extra water touching them. 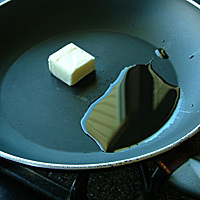 In a non-stick skillet, combine 2 T butter and 1 T oil. Cook on med high heat. Again, don't move them until they brown on the bottom. 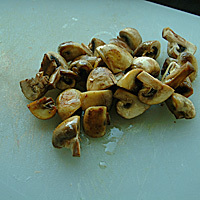 Continue cooking until the mushrooms release their extra moisture. Set aside until ready to serve.